One of the constant delights of the ECM New Series is the irresistible combination of speculative musical historiography and beauty of sound; two of its pioneers in this regard are the indefatigable Dr John Potter, renowned academic at the University of York and the singer John Potter, tenor with the late-lamented and much-loved Hilliard Ensemble; of course they happen to be one and the same individual. I have often wondered if Potter perceives one of these two admittedly complementary pursuits as more important; regardless of this the end ECM product usually succeeds in comforting the soul of this particular listener without ever really having to try. Examples that come to mind include the superb Dowland Project issues; equally enjoyable (and especially liberating) was the more left-field Being Dufay, a collaboration with Ambrose Field, an electronic composer (and Potter’s colleague at York – ECM New Series 2071 - review). For this issue (recorded six years ago but only released now) Potter co-opted a crack trio of vilhuelists, the doyenne of gambists Hille Perl and long-time collaborator Anna Maria Friman of the Trio Medieval (and York alumna). The academic point of this collaboration is to investigate how music was passed down through the generations centuries ago; Josquin and Victoria were around at different stages of the renaissance but even their sacred music could have been kept alive through the medium of tablature (the means of annotating music without staves, bar lines and key signatures for guitarists, lutenists and in this case vilhuelists) and enable its performance by single voices and instruments. Essentially this recital is a speculation about how this may have worked out in sonic terms. Potter clearly believes that while the standard acapella performance of this kind of repertoire might convey composers’ original intentions it barely scratches the surface in terms of how the music is passed down from one generation to the next, and that tablature, with the ready accessibility of the types of instruments involved was at the very least an important vehicle in the music’s dissemination. I don’t pretend to possess a fraction of the combined historical knowledge of Potter and his team, which is not really an issue here as my role is to assess the disc’s success as a listening experience of an hour and a bit. As might be expected from anything that has Manfred Eicher’s unerring ear and control-desk know-how behind it, I can only confirm that Secret History sounds intensely beautiful from first breath to last. The recital in fact begins with Mouton’s canonic masterpiece Nesciens Mater presumably as it provides a vivid template for how such ‘arrangement’ might work. Potter and Friman here sing the top ‘Superius’ parts, paired together in canon. The three accompanying vilhuelas therefore play the notes composed for the other three pairs of voices in an ingenious and ultimately convincing arrangement. Quite apart from introducing the intellectual premise of the disc the clarity of voices, instruments and production truly illuminate Mouton’s glorious inspiration. The centrepiece of this recital is a similar reduction of Victoria’s complete Surge Propera mass, itself one of this composer’s many ‘parody’ masses (in this case the model is Palestrina’s motet Surge, propera amica mea, et veni ). Potter here sings from the tenor part, whereas the accompaniments seamlessly combine the rest – in itself offering a new perspective on Victoria’s polyphony. I played this side by side with the superb Hyperion recording of this mass by Westminster Cathedral Choir under Martin Baker (MWI review here). I can confirm that the while the scale of Potter’s arrangement might be more suited to a cosy living room on a Winter night than to the grandiosity if an Iberian cathedral the essence of Victoria’s inspiration is quite undiminished. In fact the sound inevitably broadens when Friman’s pure, vibrato-free tones enter in the Benedictus and Agnus Dei. Heringman’s tiny preludes act as little scene changers – they complement this ‘vernacular’ presentation of the mass most aptly. They also give provide the opportunity to hear the vilhuela alone – here it is perfectly recorded. One might argue that a reduction of this kind would possibly better suit the spirit of Josquin’s motets, smaller in scale as they are, than a half-hour late Renaissance mass. 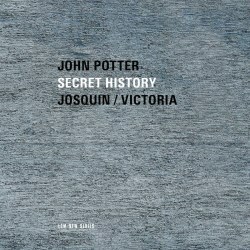 In fact Potter reveals on his website that the Josquin reductions were the original trigger for the album, and that the Victoria idea occurred later (it was the 400th anniversary of his birth in 2011 when the recording was made). Most of the Josquin works certainly benefit from Friman’s contribution which further magnifies the ethereality and perhaps the intimacy of the living room experience. Nymphes des bois, the penultimate item on the the disc was written as a mini-requiem to the memory of Johannes Ockeghem, Josquin’s great predecessor. Conceived as a chanson rather than a purely sacred piece, it mimics the contrapuntal methods of the older composer. It is a truly haunting inspiration on its own terms, a quality that certainly permeates in its incarnation on this disc. It begins with Friman accompanied by the vilhuelas of Abramovich and Santana; the moment Potter enters the fray with Hille Perl’s gamba is utterly spine-tingling. On his site Potter also muses at length upon the various practical and interpretive difficulties his group faced in the making of this disc – at the time they were essentially finding their feet in performing the music in this reduced form, more or less improvising in the style under speculation. Whatever the historical rights or wrongs of their approach, the fact that they were able to overcome these challenges is clear; for this reviewer at least there is spiritual nourishment aplenty to be garnered from this lovingly produced and intimately recorded issue.